My name is Andrew Joyce and I write books for a living. 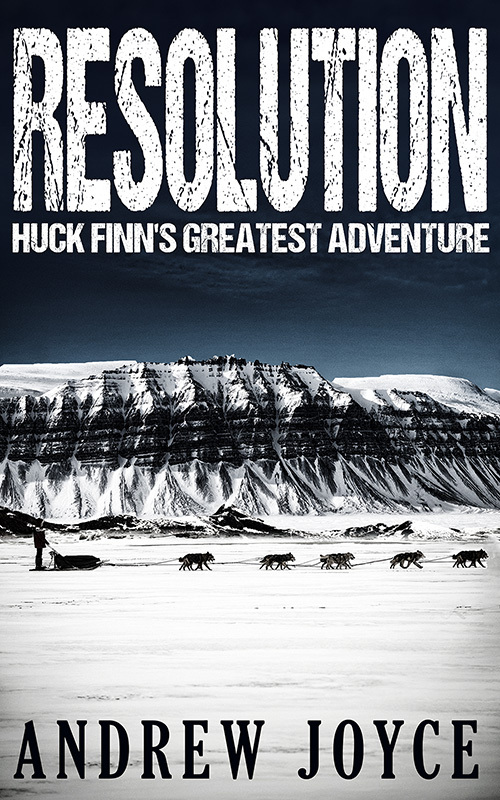 Larissa has been kind enough to allow me a little space on her blog to promote my new novel RESOLUTION: Huck Finn’s Greatest Adventure. I think it’s a good book, but what do I know? Anyway, I’m kinda shy about tooting my own horn. So I think I’ll turn things over to my dog, Danny the Dog. He always has a bad attitude and usually does not speak highly of me. But please understand that we co-exist as the old Soviet Union and the United States co-existed. We tolerate each other. So without further ado, here’s Danny. Hello, all you dog lovers out there. It's me, Danny the Dog. Andrew took me away from sitting in the shade of a beautiful old oak tree and chewing on a nice piece of rawhide. It seems he needs me to help him out here. For a person that works with words for a living, he has very little to say in real life. He wants me to tout his book for him, but I don’t think I will. Instead, I think I’ll tell you about my new girlfriend. Her name is Heather. I have many girlfriends, but Heather is my favorite. She lives on a sailboat a couple of slips down from the boat Andrew and I live on. First of all, I bet you all think Heather is a dog. Well you’re wrong; she’s a human. I know, no one is perfect, except maybe me. But human or not, Heather is cool. We first met a few months ago when she brought her sailboat to the marina for repairs. 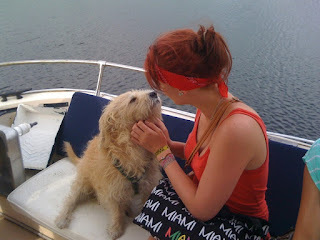 The first time I saw her, I was outside on the dock catching a few rays. I like to soak up a little sun in the wintertime (when it’s cool) to lighten my fur. I think it makes me look more attractive. Anyway, she came off her boat and scratched me behind the ear. It was love at first scratch. I’m sure she feels the same way about me because she is always giving me “cookies” as she calls them. They’re really just dog biscuits, but what the hell. A few years ago, Andrew brought some home and I wouldn’t eat one of them. He eventually ended up having to throw them out. But somehow, from Heather’s hand they are oh-so sweet. She also gave me a water bowl as a present. Nowadays when I take Andrew for a walk, the first thing that I do is run right up to Heather’s boat with my tail a-waggin’ and I won’t move until she comes out and pats me on the head. Andrew doesn’t like the delay to his walk, but he’s so well trained by now, he’ll stand there until I’m ready to go. But I’m sad as I write these words. You see, Heather is leaving me. Her boat is repaired and she will be setting sail for the Islands in about a week. I would like to go with her, and she has offered to take me, but I can’t leave Andrew. He would be lost without me. He can’t even find his shoes in the morning without my help. And who would write his books for him? No, I can’t go away with Heather. I will miss her, and out of memory of her, I swear I will never eat another dog biscuit once she is gone. That’s about it for now. If I hurry, I might be able to get home in time to have dinner with Heather. She’s a much better cook than Andrew. Oh yeah, I almost forgot—go out and buy Andrew’s book. This is Andrew again. On behalf of Danny and myself, I would like to thank Larissa for having us over. It’s been a real pleasure. Thanks for an interesting post, Larissa. Gave me a good laugh! 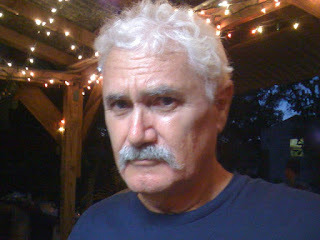 I've read Mr. Joyce's books and thoroughly enjoyed them. 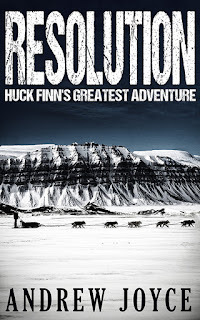 I think the book blurb for RESOLUTION shows what a wonderful writer Joyce is!